An eyelid is a thin layer of skin that covers and protects the eye. The eye contains a muscle that retracts the eyelid to "open" the eye either voluntarily or involuntarily. 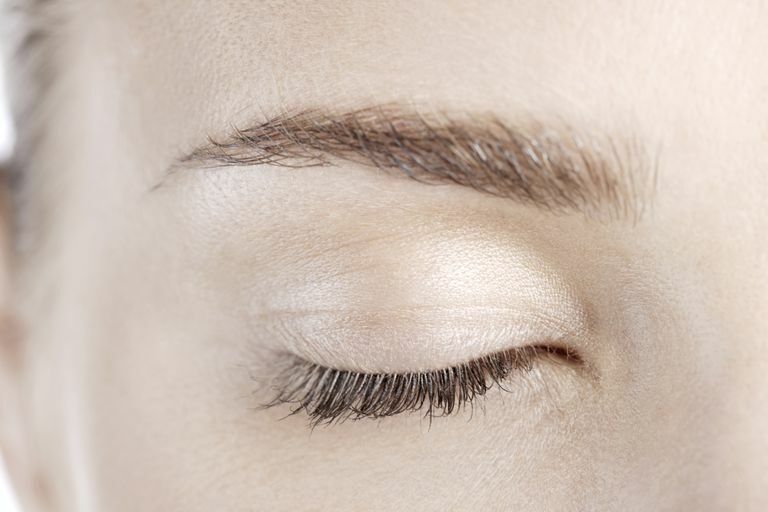 Human eyelids contain a row of eyelashes that protect the eye from dust particles, foreign bodies, and perspiration. One of the main functions of the eyelid is to protect the eye and keep out foreign bodies. Another important function of the eyelid is to regularly spread tears on the surface of the eye to keep it moist. With every blink, there is a slight pumping or squeezing mechanism that expresses tears over your eye. Also, there is a slight horizontal movement that pushes tears toward the puncta, the drain pipe for the tears for proper disposable and drainage. The eyelid contains several different types of glands including sebaceous glands, sweat glands, tear glands and meibomian glands. Tear glands that give us our every day lubricating tears are small and located throughout the lid. The lacrimal gland, which is located up under the upper eyelid and under the body orbit, secretes reflex tears. The lacrimal gland secretes tears created when we cry emotionally or when we get something in our eye. The lacrimal gland attempts to wash the debris away. Another larger muscle group called the orbicularis oculi muscles, encircle the eyes. These muscles function to close the eye forcefully when we are trying to protect our eye. The orbicularis oculi muscles also act to form facial expressions. Dermatochalasis: Dermatochalasis is extra eyelid skin that develops in people over 50 years of age. Dermatochalasis develops as a part of the normal aging process. It is caused by fat prolapsing or moving forward and eyelid tissue losing its tone as we get older. Dermatochalasis can be so severe that it blocks your upper visual field. A surgery, known as a blepharoplasty, can be performed to remove this tissue and restore full vision function. Entropion: If you have entropion, the lower lid margin turns in towards the surface of the eye. The eyelashes can rub against the cornea and the conjunctiva, causing irritation, foreign body sensation, infection, scarring and ulceration of the cornea. The most common treatment of entropion is corrected with surgery. Entropion occurs most commonly from aging. The tissue and muscles lose their tone and the skin is no longer taut against your eye. Ectropion: Ectropion is the opposite of entropion. The eyelid will fold or turn outward or simply sag lower. The eye becomes exposed and dries out. Symptoms are mucus discharge, having a sandy, gritty feeling, irritation, and scarring. It is more common as we age as the eyelid skin and muscles lose tone. A long-standing facial paralysis can also cause ectropion. When the eyelid tone becomes weak, simply rolling over on your pillow at night can cause the eyelid to flip outward. Myokymia: Myokymia is the medical term of an eyelid twitch. The skin of the eyelid moves involuntarily. Myokymia can usually be felt and seen by the sufferer. It is caused by extreme fatigue, stress, anxiety, consuming excess caffeine and spending too much time on the computer. Rest and relaxation usually are all that is needed for myokymia to resolve. Blepharospasm: Blepharospasm is the abnormal, forceful contraction of the eyelid muscles The exact cause is unknown and it does not seem to be linked to other diseases. Symptoms usually begin as slowly but increase over time to forceful contractions that involve both eyelids. It is usually treated successfully with Botox or botulinum toxin. Ocular irritation. Bell’s Palsy: Bell's palsy is a paralysis or weakness of the muscles and facial nerve on one side of your face. This condition comes on suddenly and usually gets better on its own within 4-6 weeks but can last up to six months. People often think they are having a stroke. Bell's Palsy is thought to be caused by the herpes virus that causes cold sores that reactivate in times of stress. Is It Safe to Sleep With Your Eyes Open? Why Do Some People Cry Tears of Blood? Are Your Droopy Eyelids Blocking Your Vision?